Israeli forces have detained at least 876 Palestinians during the month of October, prisoner rights group Addameer told Ma’an on Thursday. Addameer said the 876 new detainees has brought the total number of Palestinians imprisoned by Israel to around 6,200 people. 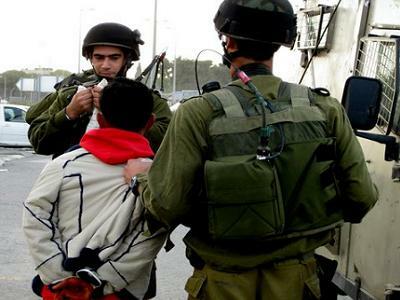 Over 500 Palestinians were detained in the occupied West bank, 213 in East Jerusalem, and 152 in Israel. Over 130 of the detainees were children, Addameer said. The latest upsurge in detentions comes as part of Israel’s crackdown on the Palestinian population, under the pretext of restoring calm in the amid an increase in violence since Oct. 1. Overnight on Wednesday alone, Israeli forces detained 84 Palestinians in the occupied West Bank and East Jerusalem. Less than two weeks ago, the Palestinian Authority Committee for Prisoners’ Affairs had counted 650 Palestinians detained during the first ten days of October. The committee said that most of the Palestinians were detained during clashes with Israeli soldiers, or subsequently in overnight raids. The committee highlighted that many Palestinians had reported being held for hours at interrogation centers, undergoing humiliation and maltreatment. Some prisoners said that they were violently beaten during their detention.